2017 is almost over. Can you believe it? That means it’s time to start planning for 2018. In the past few years, there have been years that I have been intentional about setting goals and other years I have forgotten to set goals entirely. I have definitely seen a difference between the two. Now, I’m not saying that I have met all of my goals the years I did set them, but it did help me focus on what I really wanted to accomplish. Unless we are intentional about our goals, we may find ourselves at the end of 2018 wondering if we really accomplished anything. This year, I decided to start writing down my 2018 goals as they came to me at the beginning of October. It helped relieve some of my anxiety knowing that I had written it down so I wouldn’t forget it. 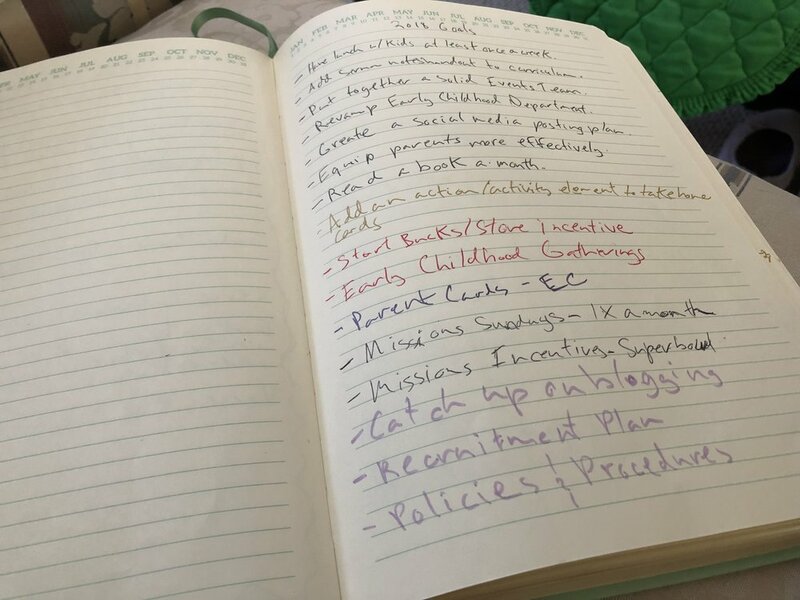 Since October, I have continued to write down my goals for 2018 in that list, and I have ended up with a decent list of items to work on in 2018. The list can be a bit daunting so I decided to break it up into categories. Side note: I know my handwriting is atrocious. Feel free to laugh! Have lunch with a kid in school once a week. Create Desert Springs Kids bucks/store. Make one Sunday a month a Missions Sunday. Hold Early Childhood Gatherings for volunteers. Add sermon notes handout option. Add an action/activity element to take-home cards. Put together an Events Team. Create a weekly social media plan. Create a volunteer recruitment plan. Catch up on blogging on kidmincorinne.com. That’s what I have so far, but I’m sure I will continue to tweak and add to the list even as I enter 2018. If you are interested in setting intentional goals for your personal life or ministry I would suggest beginning with these three steps. Start by making a list, perhaps over a few weeks, of everything new you would like to accomplish in 2018. You might prefer to write your list on paper, or you could use an electronic app like Wunderlist. For some reason, I just like making my original lists on paper. My husband will never understand why I do this, but it works for me. Your categories might look similar to mine or completely different. I made my master list and chose my categories by looking at my list of goals. Choose categories that will make sense to you. Try to stick to no more than five categories to keep it simple. This is the next step I am working on. You may want to include your team of volunteers, your assistant, or other team members in deciding what some reasonable deadlines might be for accomplishing your goals. If you don’t set deadlines, you may never accomplish your goals. Don’t skip this last step! I hope this post will challenge and encourage you to start setting goals for your ministry in 2018. What about you? What are some of your goals for your kid’s ministry in 2018? Leave a comment below!